You know how annoyed you get every time you use your MacBook's trackpad and it makes a clicking noise? Nope, we don't either, but Apple has been awarded a patent for a touchpad that comes equipped with no buttons whatsoever. 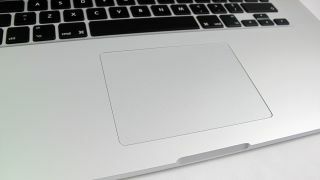 The idea is that the tiny hinge that currently resides within the MacBook's trackpad would be replaced with tactile feedback and a four-corner sensor that tracks exactly where your fingers are on the pad. Although the patent was only awarded this week, it seems that Apple actually applied for it back in 2009. This could well mean that Apple has forgotten all about the technology and decided that hinges are actually a good thing, or now it has the patent we may see the technology in an upcoming version of the MacBook Pro. According to AppleInsider, the site that scoured the US Patent office for the scoop, if the hinge-free trackpad ever sees the light of day then it is likely that you can change the sensitivity of the pad for your finger strength. And if Apple does go hinge-free then it would save some space on the chassis of the MacBook. Oh, and there is talk that even though the hinge wouldn't be there, the clicking sound could be added so you don't miss out on the real-life noise an Apple trackpad normally makes.